Google released some interesting data on hacked sites and their attempts to notify webmasters that their sites were compromised. They also released information on just how many sites are hacked – Google detected over 800,000 alone last year. 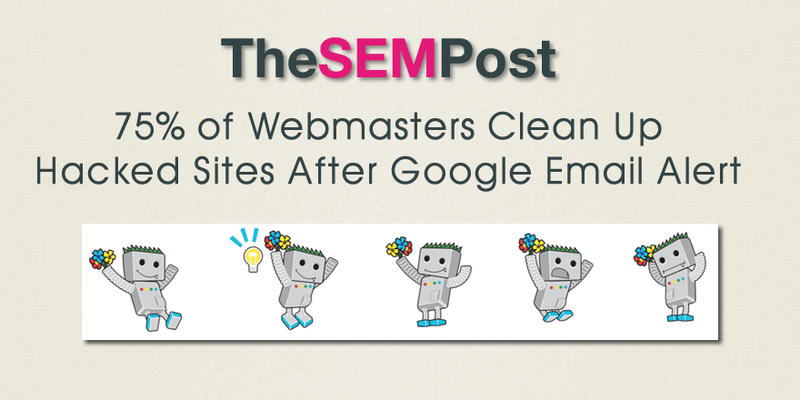 This led to 75% of hacked sites being cleaned up when Google was able to notify webmasters via email through sites registered in Google Search Console. Google was less successful via browser and search alerts (such as “this site may be hacked”), which saw only 54% and 43% cleaned up respectively. In the Google Webmaster Help forums, webmasters often show up with “this site may be hacked” alerts or notifications about sites being compromised and swear their site is clean… yet usually people can spot hacked content on those sites pretty quickly. When Google sends examples of hacked content, site owners are able to clean up their sites much quicker – an average of 3 days and 62% faster. Google found that only 12% of sites were reinfected within 30 days of the initial cleanup. This is pretty impressive and shows site owners actually are fixing the exploits (such as older versions of WordPress or a plugin that hasn’t been updated) that caused hackers to exploit the site in the first place. Google discovered over 800,000 compromised websites last year, or 16,500 per week. That is quite a number. While Google doesn’t show dates on their charts, those spikes are likely related to some well known exploits of very popular plugins we saw last year, where a significant number of sites were hacked.